A new range of dyes and mordants, to create vibrant natural shades at home. Hematoxylin - natural brown/black dye. 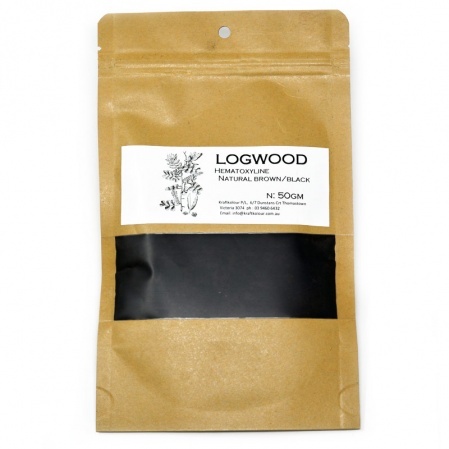 Logwood Extract is derived from the heartwood of the Logwood tree and yields deep red purples, blues blacks and dark browns.The logwood tree grows in Mexico, Central America, Dominican Republic, Venezuela, Brazil, the Guyannas, Madagascar, and India. Logwood extract will give a medium depth ofshade at 2% WOF. Mordant with Alum at 15% WOF for protein. Mordant with tannin at 8% WOF then Alum at 15% WOF for cellulose. The addition of Iron to the dyebath with dramatically improve its lightfastness. Before 1856, Natural dyes were used in time honoured techniques (as far back as 1500BC) but once synthetic dyes were became commercially viable textile dyers and artisans moved from traditional natural dyes to synthetic dyes to colour their cloth and fibre. The Natural Dye range will dye any natural fibre using a handful of non-toxic mordants and additives to help fix the dye and also give you more colour variations. Natural dyeing is very much about reconnecting with the past - apart from using the plant materials you have at hand in your own garden, there are a number of traditional Natural Dyes and extracts including Indigo, Madder, Cochineal and Fustic. By combining different dyes, mordants and depths of shade, you will produce an amazing palette of deep to subtle pastel colours. We hope you enjoy your Natural Dyeing adventure!